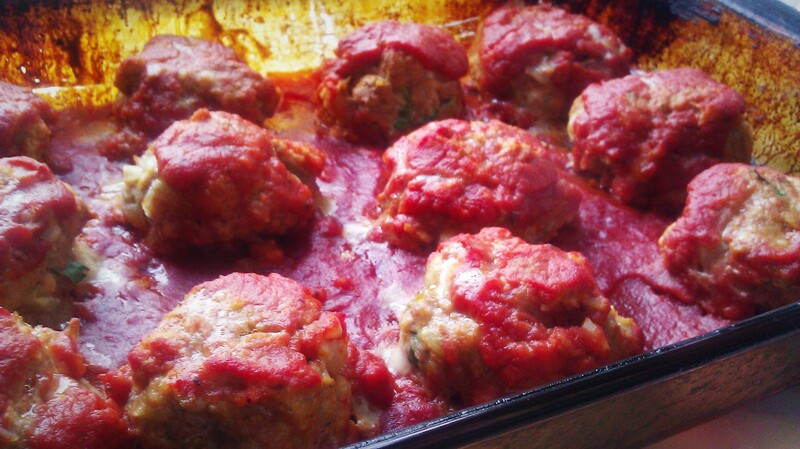 Baked Turkey Meatballs | happyspinach etc. So the other evening I did something I’ve never really, really done a lot of before. I worked in the yard. And when I say worked, I mean worked. I teamed up with my mum to tackle the bushes and hedges with hedge trimmers and chop them down to size. We trimmed and sculpted the little bushes into tight and symmetrical spheres, I flattened the hedges to a near perfect plane, and we planned what to do to better the yard even more. And after all of that manual labor, I’m really impressed with everything we got done. There’s still a lot to be done of course (namely chopping down the hedges even further), but our yard is going to be pretty spiffy. The whole experience was thoroughly inspiring, and now we’ve got a whole lot of ideas of what to do with the remaining beds in the front yard and the surplus in the back. The back yard is what I’m most excited about because that is where we’re going to be putting together a lovely little vegetable plot–bush beans, sugar snap peas, cucumbers, zucchini, cherry tomatoes, peppermint, spearmint, basil, etc. And, since we’ll be growing these darlings from seed, they’ll be significantly cheaper and healthier than their grocery store counterparts. But now let us move on to the topic of these incredible meatballs. These meatballs are amazing, easy to make, and surprisingly tender and flavourful for being ground turkey. As a whole, ground poultry can easily become bland and overcooked, but that is far from the case with these fellows. The zesty mix of spices, parmesan, tomato paste, and fresh parsley make bring plenty of flavor while the bread and egg help make a tender yet substantial ball. And then baking them in the sauce really is the finishing touch–there’s no residual fat to fry them in, they cook evenly, and the sauce reduces to and incredibly rich tomato flavour. While meatballs are traditionally served with some sort of carbohydrate–on top of pasta or between two slices of bread–I really find that these can readily stand on their own. Recipe from Joy Wilson over at Joy the Baker. Preheat oven to 375 degrees F with racks in the center and upper third of the oven. In a medium bowl, tear up the bread. Pour milk over and allow to soak for about 5 minutes. In a medium saucepan, heat the olive oil over medium heat. Add in the onions and saute until golden brown, about 10 minutes. Add in the garlic and saute another minute. In a large bowl place in the turkey. Squeeze out any excess milk from the bread and add the bread to the turkey (discard the milk). 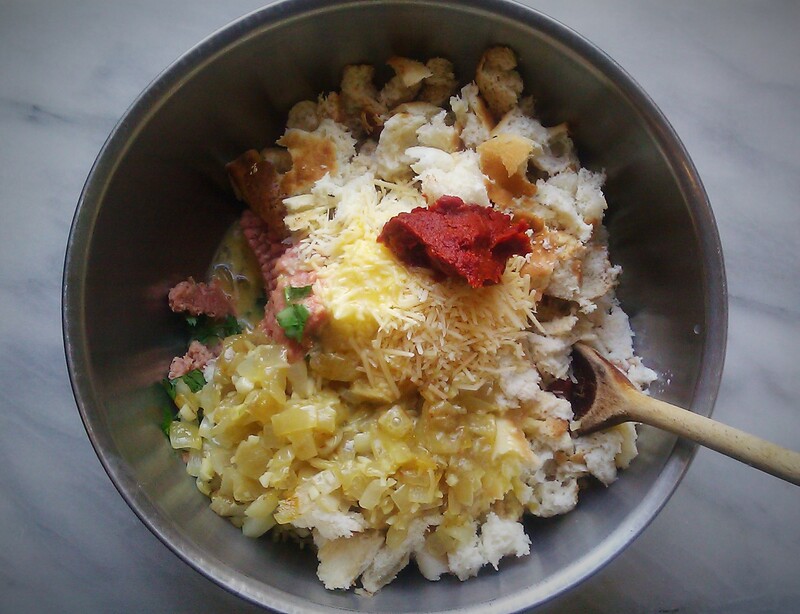 Add in the eggs, salt, pepper flakes, oregano, parmesan, tomato paste, and flat leaf parsley. Using a wooden spoon or your hands, mix everything together until evenly combined. Pull out two 9 x 13 pans and pour about one cup of sauce into the bottom of each pan. 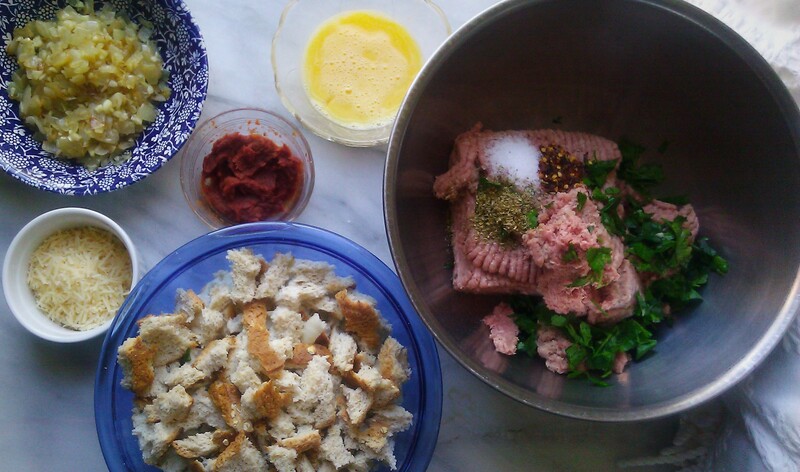 Using damp hands, form 24 meatballs out of the meat. Each one will be about three tablespoons worth of meat. Place 12 into each pan and top with a small spoonful of sauce. Place the meatballs in the oven and bake for about 25 minutes, or until everything’s bubbly and the meatballs are cooked through. Serve with pasta or with a hearty green salad or just by themselves! Leftovers will stay fresh wrapped well in the fridge for 4 days. 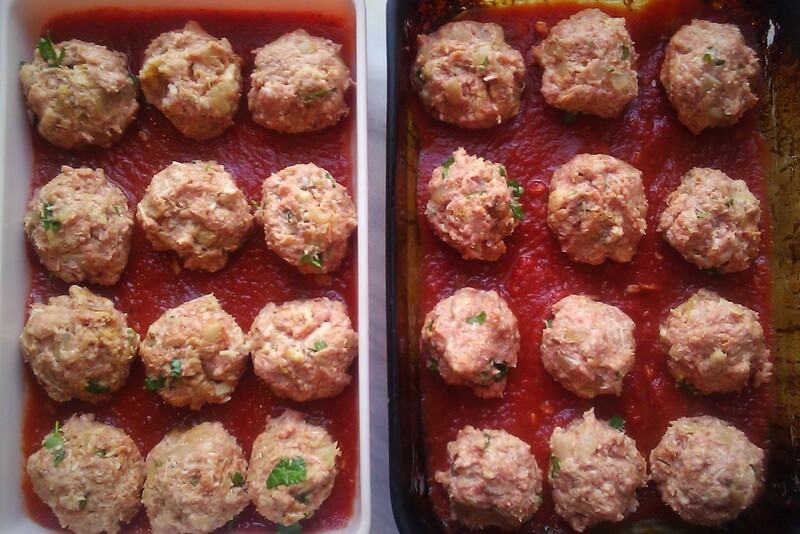 This entry was posted in Meat, Pasta, Tomato and tagged meatballs, Pasta, Tomato, turkey. Bookmark the permalink.